What are New Yorkers dressing up as for Halloween? Well, there's the "greedy banker" outfit (pinstriped suit, pig mask), the "client nine" (a.k.a. the Eliot Spitzer, which apparently involves a prison jumpsuit), and of course the Joe the Plumber, complete with toilet plunger. But local Halloween go-to Ricky's NYC - which every year packs its stores with costume merch and adds a few Halloween-only pop-up stores to handle the demand - says that come Oct. 31, the outfit you'll be seeing most on New York City streets is Caribou Barbie herself. Until now, Obama masks have been the biggest sellers (though we wonder how much of that market was cornered by the Brooklyn Industries run on the masks to pack its windows with creepy Obamaquins), all of which becomes increasingly interesting in light of the theory - which has stats to back it up -- that sales of Halloween masks have traditionally been a fairly accurate predictor of election results. 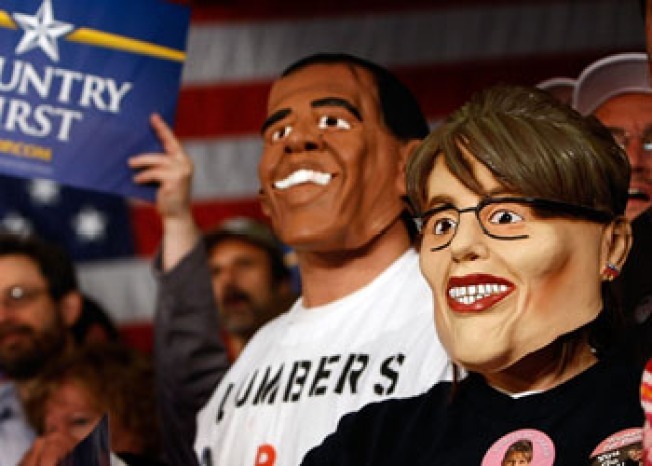 Of course, the same report noted that Palin had entered the race too late for manufacturers of Halloween costumes to create masks in her likeness. Never underestimate the power of well-timed entrepreneurship: Thanks to overnight shipping, you can still get your hands on one of these $25 puppies from Costume Kingdom (is it just us, or does this mask make her look a little like Al Franken? ).